This week's table setting was crafted with a retro theme in mind, using items mostly from Iittala. The brown hues reminded our visual merchandiser Alex of the 80's, and she created a whole table with that theme in mind. Photo 1: Vintage Retro Setting. Simple, classy and sophisticated. Iittala Sarjaton Dinner Plate in Metsa/White, Iittala Sarjaton Bowl in Letti/White, and Iittala Sarjaton Pasta Bowl in Letti/White. Set over a Libeco Home Vence Linen Napkin in Dark Grey and Chilewich Mini Basketweave Rectangular Placemat in New Gold. 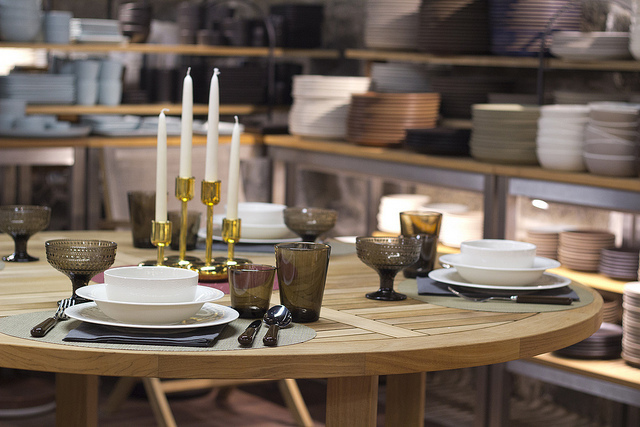 Iittala Nappula Large and Small Bronze Candleholders. Set over a Chilewich Bamboo Round Placemat in Cranberry. Serve in Style with New Match Pewter!